One of the things that jumped out at me watching the documentary Back to Eden was Paul saying that as he harvests his potatoes, he puts the biggest and best potato back in the hole. So you are planting at harvest time. I have NEVER heard of this before. He also says to plant the potato whole rather that cutting them up. I have a lot of potatoes harvested this year. I got the originals from Compassion Farm as a gift after volunteering, so I am going to make a special experimental potato garden using them. If it is not pouring, I will go out today and do it. I will update this at harvest time 2015. 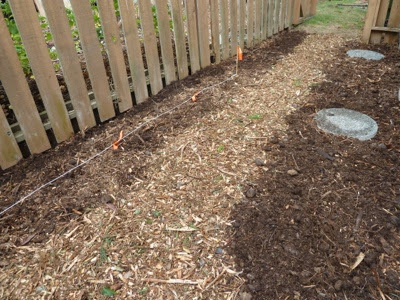 The chosen area for the fall planting of potatoes 'test garden'. This trough is deeper than it looks. Probably about eight inches deep. 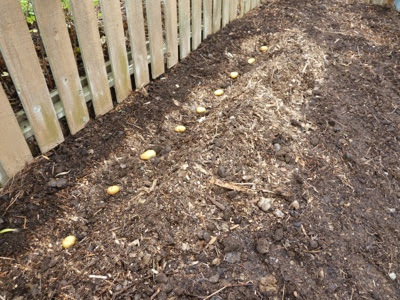 I planted potatoes harvested this year. 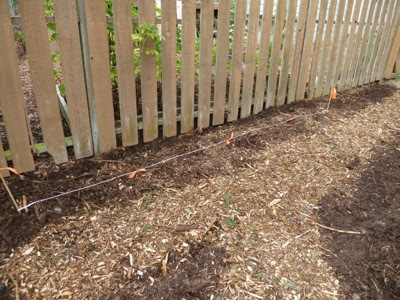 String and bright orange tape to show us where the potatoes are planted. I decided to make some wood chip paths so that we can get around this area without walking all over the manure. Here is a short video where Paul is telling a tour how it's done. This is an interesting theory planting as you harvest. I don't know how that would work here in Ontario with our harsh winters. I'll have to check into it. I'll look forward to reading about your progress. That is a good question. 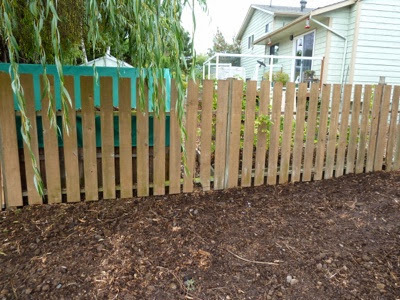 Do you ever have them pop up in a compost bin or garden bed? ie..wintering over?